We are honored that the lovely folks at GoShiftKey.com thought enough of Supermodel Astronaut to blog about it. Check it out! Ellen got to answer several questions for the lovely people at crazypellas.net about the Year of the Groove. Check it out! Fox 17 in Nashville featured the Supermodel Astronaut video on their morning news! THE SUPERMODEL ASTRONAUT CHALLENGE: Step 1. Take the SUPERMODEL ASTRONAUT PLEDGE: I PLEDGE TO EMBRACE THE TRUTH THAT I AM ENOUGH. http://youtu.be/CYIE1IO3Sig I WILL BE AWARE OF AND TRY TO STOP: - Thinking and saying critical things about myself - Thinking and saying critical things about other girls/women - Comparing myself to people on magazines, billboards, TV, movies, and even pinterest. Huffington Post features Supermodel Astronaut! 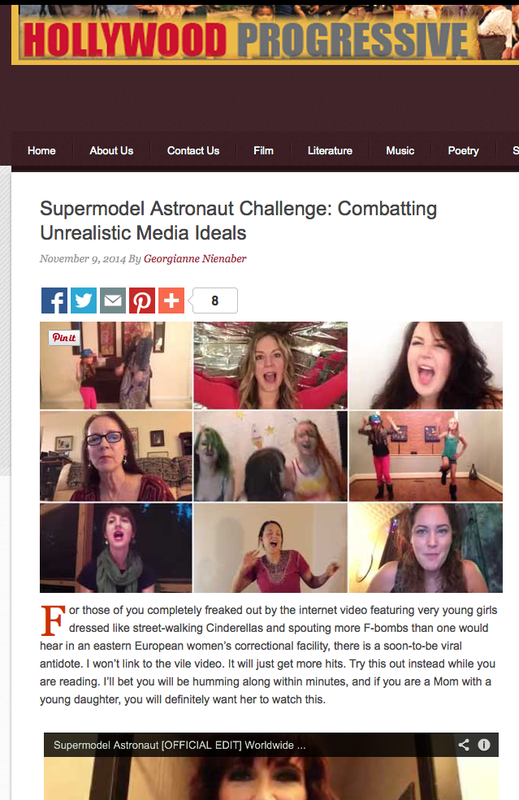 Worldwide Groove Corporation are getting coverage from Huff Post for the Supermodel Astronaut Challenge! HollywoodProgress.com features Supermodel Astronaut Challenge. Worldwide Groove Corporation are getting broader media coverage with their Supermodel Astronaut release. This is the second time WGC have been feature on this great music blog. Here is a one hour audio podcast where Indie Music Lives Here did an in depth interview with WGC. They talk about what they do, who they do it for, and how people sometimes steal their music.